Removing damaged or weathered concrete surfaces. The deck and side walls of a reinforced concrete road bridge had decayed to the extent that surface repairs were needed. The top few centimetres of concrete needed to be removed and replaced with new material. The traditional method of removing the old material is to use hand-held pneumatic breakers, which can expose workers to typical vibration magnitudes of 12 m/s2 for about 3 hours per day. The use of percussive tools can also damage the reinforcement bar, which then has to be repaired or replaced, and cause cracking in the base concrete which may weaken the structure. The operators work to a specified depth, often unnecessarily removing sound material and leaving areas of deep damaged material. The surface also requires thorough cleaning before new concrete can be applied. The job would have taken about 60 worker days with the breakers, as well as additional time to repair the reinforcement bar and other damage. The job was done with a robot-mounted water jetting machine. 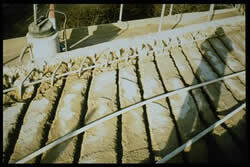 This process uses an extremely high pressure water jet to wear away the old damaged concrete. The jet removes all concrete up to a certain strength, regardless of depth, leaving the good material and removing all of the damaged material. The water jetting process was more expensive than the use of hand-held breakers. 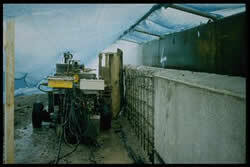 However, the cost of repairs to the reinforcement bar and base concrete was eliminated. These reinstatement costs often result in total project costs significantly higher than those for the water jetting method. Operators are not exposed to any hand-arm vibration. The reinforcement bar was completely unaffected and there was no damage to the base concrete structure so it was immediately ready for the application of new concrete. The new concrete adheres better to the jetted surface. Airborne dust levels are very low as the debris is washed away by the water.